If you teach piano, it’s likely you teach Christopher Norton’s music on almost a daily basis. His name is synonymous with “The composer who creates the music my students always love.” To say Christopher Norton is a prolific composer is a serious understatement; his influence on not only piano repertoire, but on multi-instrumental and choral repertoire is powerful. 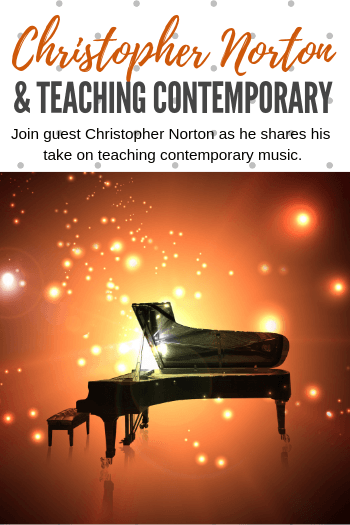 His expertise on the area of teaching contemporary music was something we wanted to hear first-hand and so in this TeachPianoToday Podcast episode we chat with Christopher Norton to discover his take how to use contemporary music to create better musicians. Christopher Norton is easily one of the most well-known figures in piano education right now and we were honored to have had the opportunity to talk with him! Click the link below to listen to the podcast or download it to your iPod by visiting our iTunes page here.